After a terribly long trip from Nagoya, we arrived in Santa Fe, a place so opposite the Japanese cities we visited on the ONL tour that not only jet lag, but also cultural shock, set in. I am here for the duration of the summer, conducting five performances of Samuel Barber’s masterpiece, Vanessa. When I was here several years ago, I had suggested that this work would be a good one for me to do, and everyone seemed to agree. 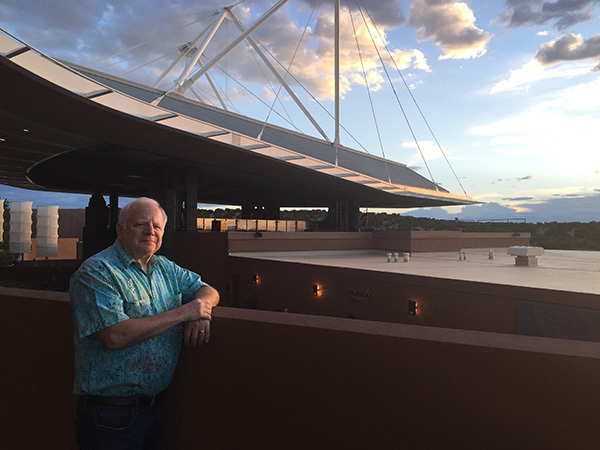 The fact that it has never been presented at the Santa Fe Opera, which is celebrating its 60th year, took everyone by surprise. Some of you will remember that a few years ago, I kept a diary, posting almost every day about what turned out to be an ugly chapter in my musical life. The Metropolitan Opera provided the backdrop for what would become an unfortunate confrontation with one of the major divas of today. The New York Times weighed in with “In Revival of Verdi, A New Note of Drama.” They followed up with an article about the great Verdi conductors. Although I was not on the list, it was probably the only time I will appear in a published article with the likes of Toscanini, Muti, and Kleiber. This time around, I am going to try again. The whole purpose of the original blog was to let music lovers in on how a production is put together, and that is exactly what I am going to do this month. It will be honest, but there are no anticipated traps, unless someone gets bitten by a recluse spider. All of the cast has arrived, some from distant shores and others from engagements in the States. I had less than 24 hours to recover from the long haul but knew that I would not see the orchestra for about three weeks. The production of Vanessa is being directed by James Robinson. We worked together several years ago at the Hollywood Bowl, when we semi-staged a version of Amadeus. The campus, and that is what it is called, consists of the opera house, administrative facilities, and several rehearsal halls and studios. There are around 500 people here, and the festival itself is up and running for about two months. Opening night was two days ago with Don Giovanni. The operas are dropped into performance almost a week apart, and then there are two weeks when all five are performed in a row. Ours is the final one to be presented. The cast gathered in the Ranch House, which also contains the offices for the staff. Aside from James Morris, I knew no one else and had never before worked with any of the cast. It also turned out that I was the only one who had ever performed this opera, although that was in concert presentation and recording. We introduced ourselves, and the principals, along with the understudies, assistant conductors, pianists, and production crew, were all present. At a little over 7,000 feet above sea level, Santa Fe presents challenges for all of us, especially singers and wind musicians. Most of our cast had only arrived one or two days prior to this rehearsal, so I was skeptical as to their ability to get through the whole opera in full voice on this day. Much to my surprise, everyone gave it their all, almost as if showing off for their colleagues. We decided the best thing to do was simply to run through the opera, with as little stopping as possible. Getting the lay of the musical land seemed a good idea and would help me in determining how best to help them as we go forward. The rehearsal was scheduled to go from 11:00 to 1:00, with an hour lunch break and then a second rehearsal in the afternoon. Everything was going so well that when we reached the two-hour mark, we decided to simply finish up the last 20 minutes or so and call it a day. I had the information I needed, and the singers knew more about each other, which would most likely come in handy as we worked on phrasing, diction, and balance over the next few weeks. This was the day that our director and the production team presented their view of the opera. All of us gathered in the Ranch House, where a mockup of the set was placed on a small table. The whole of Vanessa takes place in one room with some other scenes done either offstage or off to the side. Since there is no indication in the score of exactly where or when things occur, there is certainly license to be creative. We know that it takes place in winter in an undisclosed Scandinavian country, that the house is somewhat large, and that the drama is played out more psychologically than physically. The libretto tells us that Vanessa has covered up all the mirrors, probably to hide her aging reflection from herself. She has several servants and clearly lives a very lonely life, only including her niece—possibly daughter—and her mother, the baroness. The relationships become confusing and are open to interpretation. Any concerns I had regarding the ability of the singers to be heard were cleared up when I saw that there is plenty of reflective material on stage. There is even a conical backdrop once the big mirror at the rear of the stage is uncovered. Director James Robinson seems very easy to work with, and our method for rehearsing appears to be the same. We will deal with staging and musical matters at the same time. The costumes will place the work somewhere in the 1930s. Inspiration for this production comes from the film world, particularly noir works such as Notorious and Spellbound. There are also references to early Ingmar Bergman. The servants will be in what Nordic wear might have looked like at the time. Lots of dress and coat changes for the leads. In the evening there was a welcome party for the cast and crew. Cindy and I sat with James Morris and Erie Mills, the diction coach. She was one of the finest singers I had ever worked with, but that was a long time ago. Her Zerbinetta rivaled anybody’s, and it is great to get to be working with her again. We moved out of the Ranch House to the Richard Gaddes Rehearsal Hall. Richard was the head of Opera Theater St. Louis for a long time and then took over here in Santa Fe. With Charles MacKay, also a former head of OTLS, now in charge, there are strong connections to my old stomping grounds. We will be based in this facility for the next ten days. With the concept, both musically and visually, now known from the first two days, it was time to begin to put these two elements together. Jim Robinson and I had decided that we would just start from the top of the opera and work our way through, as the scenes are set pieces that can be best understood as they occur chronologically in the opera. The plan was to get through the first half of Act I, which sets up the story line for the rest of the show. Jim works very efficiently, and while we are watching him with the cast, I jump in with my own musical suggestions for the singers. It is clear that they understand the characters they are portraying, but as the rehearsal progresses, it is also clear that there are several questions that go unanswered throughout the libretto. Our job is to try to clarify the ambiguities when possible. For instance, it is really not clear what happened to the young Anatol’s father and what his mother’s role in his demise might have been. We don’t know exactly why he shows up at this time. Our approach is that the father has squandered away his fortune, leaving his son broke. Since Vanessa’s name frequently came up when the boy was younger, he has come to visit, perhaps to see if he could latch on to her obvious wealth. I could go on and on about the vagaries within the story, but there is still a long way to go. Erin Wall, Virginie Verrez, Helene Schneiderman, and Zach Borichevsky all threw themselves into their roles full throttle during this first go of staging, holding back very little. My pianists are incredible, and we have the irrepressible Erie Mills as diction coach. Oh, and the lemonade at the cantina is very good. The tragic events of the past week put a pall on my own mind, but the world goes on. One is reminded of the ability of music to take people out of gloom and despair, at least for a few hours. We had a complete run through of Act I yesterday, and it has come together very well in a short time. Now we are moving on to the second act but without the chorus or various smaller roles (those who do not sing). Again, the rehearsal pace has been rapid and focused. It is more than I can say for the leadership of the country at the moment. The time for words is quickly coming to an end, and some actions are necessary if we are to avoid the catastrophes of the 1960s. France got surprised by Portugal in Euro 2016. The States were on edge with protests and demonstrations. North Korea was rattling swords again. Here in Santa Fe, it was just plain hot. By 5:00 in the afternoon, we had completed the blocking for all the principals in Vanessa. Jim Robinson’s work was efficient and collaborative the whole way. There are still a couple hurdles, most notably how to deal with the offstage banda, but we will all sit down and work it out. I have also been able to complete rough drafts of several chapters of my new book. Most likely I will not finish the work until October or so, but it seems to be flowing quite well. That is the big advantage of being in one place for an extended stay. And aside from The BFG, there just have not been that many movies to excite the imagination so far this summer. We got down to business with the orchestra. This is a tough score, written at a time when key changes occurred frequently, and sometimes encompassing seven sharps or flats. This is not easy stuff to sight read, but we got through most of it. I felt it was important to give the musicians an idea of the work as a whole, trusting them to look at difficult passages on their own. My job is to see to it that the dramatic nature of the work is played out with the orchestral palate as well as onstage. Utilizing an orchestra more or less the size Brahms would have, save the offstage banda, Barber produces some of his richest and most colorful textures. Learning the notes is just the start. With two of the five productions at Santa Fe Opera already in performance, the orchestra already has a lot of music to tackle, and this is the most difficult of time periods for them. But we seem to get along very well, and I have the utmost confidence in how this will all turn out. I had the opportunity to go to the opening concerts of the Santa Fe Chamber Music Festival. My good friend Jimmy Lin was among the featured artists, and of course it was a pleasure to hear him in Mozart and Tchaikovsky. His mother was here, and apparently I had not seen her since Jimmy and I recorded Bruch with the Chicago Symphony in 1986. She looks great, and hearing her stories about the sacrifices she made for her son were incredible. We finally got onstage! Not with the orchestra yet, but at least there was a chance to get an idea of the space we would be performing in. By this time almost all the kinks were out of the way, and everyone adjusted to the new environment very easily. I let my assistant take over part of the rehearsal so that I could go out in the auditorium and see how well the voices projected. No problems there. The orchestra descended into the pit, and now almost all the musical forces were assembled. We have two rehearsals and two days to get through the whole opera. My method was to go through each large scene without pause. When those ended, I had the musical staff come up to the pit and the cast come downstage. They ticked off the spots where there were balance problems, and I rehearsed passages that did not go as we all wished. This proved efficient and gave everyone a voice in clarifying any problems. The same procedure would take place the next day, but now we would add all kinds of offstage sounds, such as chorus, organ, and an accordion. We are in the final phases of preparation. Rehearsals now take place in the evening, as lighting and technical matters need to be done under performance conditions. For the first three weeks, temperatures were very high, but all of a sudden, it has cooled off quite a bit, and on this night there was even a chill in the air. Officially, tonight was called a “piano dress rehearsal.” The idea was to go through the entire opera without pause, but since this was the first time that the set, costumes, lighting, and entire crew were involved, there were moments when we had to stop and correct a few things that were not quite working. Starting at 8:30, we did not finish until almost midnight, but that is par for the course at this kind of rehearsal. Musically all of us were on the same page, and from my vantage point in the pit, it looked very good. With two full orchestra rehearsals left, I think we are in fine shape for opening night on Saturday. Guessing what will occur each evening at the political conventions has become a sport during down times at these rehearsals. We have decided that the audience attending the opera should come with banners representing which states they are from. And of course, at intermission, each must say something trivial about their home. We had the first of two orchestra dress rehearsals. All the elements come together for a trial run of the show, with costumes, lighting, sets, and everything else one would expect at the performance. It really is the last time we have to tinker with details, small and large. Of course, the orchestra and I do not come in our formal wear. There are about 50 people attending, mostly from the administrative side of the Opera. After the first act, I was told that we were playing just a little too loudly for all the words and notes to get through. Before we began the second act, I told the orchestra to tone it down but keep as much contrast as possible. It seemed to do the trick. We get a day off tomorrow before the final dress rehearsal on Thursday. No major glitches at the final dress rehearsal. With just one intermission, the opera will come in at 2.5 hours long. Because the sun is still a bit high up, our first performance starts at 8:30. The reason is that the open areas of the house are bathed in light, and it is difficult for everyone to see the stage. So, in a bit of a dichotomy, the opera, which begins in an undisclosed Scandinavian town in the winter, will be seen with the background of the Santa Fe summer sunset. A triumphant night for everyone, especially Samuel Barber! One could sense the audience’s involvement throughout the evening. Most people do not know this work and were probably a little anxious that it might be “one of those” operas. But it was clear early on that they knew something special was going on. In the tradition of grand opera, there are arias, set pieces and the magnificent orchestral Intermezzo. To say that the cast was superb would be an understatement. With voices perfectly suited to their roles, and acting abilities to match, the intimacy of the work came through loud and clear. The production values were immense, mostly due to the sensitive direction and atmospheric sets and lighting. Balances seemed ideal, and the orchestra responded with sumptuous playing. We have four more performances during August but lots of down time. All we can do is keep getting better, so if you are planning a trip out to Santa Fe, come check out this opera, one of the most satisfying performances from the pit I have ever been involved with.